Improve the population status of at-risk migratory shorebirds by increasing protection of at Rio Gallegos Estuary, which is designated by the Western Hemisphere Shorebird Reserve Network as a site of International Importance. Río Gallegos Estuary is an important stopover site for thousands of White-rumped Sandpipers, Baird's Sandpipers, and Sanderlings, hundreds of Hudsonian Godwits, hundreds of threatened Magellanic Plovers, the Critically Endangered Hooded Grebe, and thousands of Two-banded Plovers and Magellanic Oystercatchers. 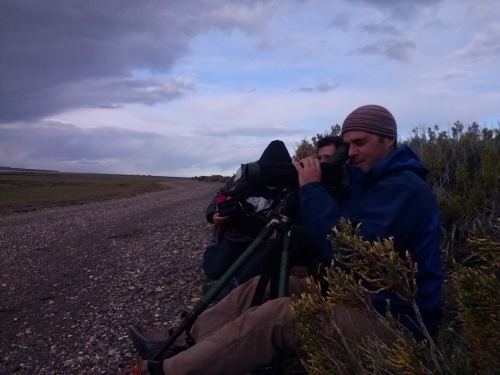 The municipal reserve of Rio Gallegos has flourished under the management of ICFC partner Asociación Ambiente Sur, but until this project, little had been done to protect the provincial reserve, despite its even greater importance for migratory shorebirds. Threats include illegal use of fishing nets, off-road vehicles, dogs, and free-roaming horses in shorebird roosting and feeding areas. This project addresses this gap. conduct educational campaigns and a popular annual Shorebird Festival. Our partner is the Argentinian conservation organization Asociación Ambiente Sur. The Rio Gallegos Estuary includes two large reserves dedicated to the conservation of migratory and resident shorebirds. Together these reserves are home to thousands of Magellanic Plovers, Magellanic Oystercatchers, White-rumped Sandpipers, Hudsonian Godwits and Red Knots. The bay is also a non-breeding site for the Critically Endangered Hooded Grebe. The estuary was designated as a WHSRN site of International Importance in 2005. Thanks to the work of Asociación Ambiente Sur, a Shorebird Interpretive Center was established in 2011 and Shorebird Festivals gave been held each year since 2012. With support from ICFC since 2014, Asociación Ambiente Sur has been able to increase the number of conservation agents in the field to better assess threats, track shorebird populations, advise the managers of the municipal and provincial reserves, and carry-out important management actions such as mapping and marking reserve boundaries, and enforcing protections against illegal fishing and driving in shorebird habitat areas. The growth of population of Rio Gallegos city has led to the expansion of a large landfill on the boundary of the Municipal Reserve. Blowing trash, leaking waste, and trucking activities all potentially effect the health of the reserve. Previously unregulated fishing with shoreline nets is an on-going issue, and includes disturbance by off-road-vehicles used to set and access fishing nets along the reserve's shoreline. The presence of a significant population of feral horses in the Provincial Reserve must be assessed and managed to reduce their threats and impacts. With two reserves owned and managed by different government agencies, it is critical that cooperative efforts be employed to better protect the shared natural resources of the estuary. The number of provincial conservation officers working in the Provincial Reserve is not enough to protect the main vulnerable shorebirds sites. With this project, our partner Asociación Ambiente Sur have an agreement with the province of Santa Cruz to collaborate in affording the level of protection needed. Provide expert input on shorebird conservation needs in relation to coastal development affecting sensitive areas along the Provincial Reserve of Río Gallegos Estuary to develop a Management Plan and coordinate actions with the management of the Municipal Reserve.